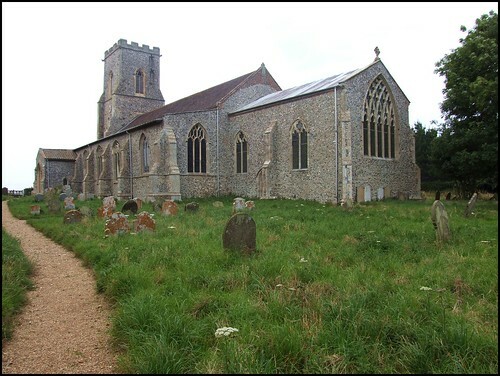 Tom and I had both foolishly left home without an Ordnance Survey map, and although we'd come upon East Ruston through the cunning use of road signs, there was neither hide nor hair of a church in the place. We drove on and on for several miles out of the village centre, and then all at once there was a rough and mighty tower keeping level with us across the fields. To reach it, we turned out onto what was a busy road, and approached the curiosity of a red brick nave against the sulking tower. If it hadn't been for the tower, we might almost have thought the building was an old chapel or even a school. It was difficult enough to slow down in the stream of traffic, let alone pull off to park: it was easy to see how this sprawling church, so far from its nominal village and with no parking, had been declared redundant. As ever, the Churches Conservation Trust prove to be wonderful custodians, and this building was in real danger in the years before they took it over in the early eighties. Largely a construction of the immediate post-Black Death period, it had been a big church; but the north aisle was demolished in the 18th century, hence the rather unusal red brick replacement wall. The view from the south-east is more conventional. You step into a wide, light space, cleared of clutter and an oasis of stillness and silence after the busy traffic outside. The most striking feature is the rather remarkable font. The base is surrounded by wicked looking demons, who stand out all the more because of the rather stark column that rises from among them. Some of the images on the panels are rather odd. A bearded head with long curly hear surronded by a jagged nimbus may be intended as God the Father, but looks like nothing so much as a Greek God. All of them may well be the fantasies of the 19th century restorers, who were at work here in the 1880s. The great survival here is the rood screen. I wonder how many times I have written that sentence on this site, but the screen here really is quite extraordinary. Its oddness is first apparent in that, although it survives to loft floor level, all the tracery above the dado has been removed. But what makes it strangest of all is the width of the opening - in proportion to the size of the screen, the widest in East Anglia - and the two lions which flank the entrance. I do not think there is another screen at all like it anywhere in Norfolk or Suffolk. There are just eight figures - the four Evangelists, with an angel representing St Matthew, and the four Latin Doctors. The arrangement is similar to that at Morston. The lightness and simplicity of the interior are perfect foils to font and screen, although there is a relatively unexciting Presentation of the Temple in the south aisle east window. The five light east window of the chancel is surprisingly wide for what is a relatively small chancel. The nave roof is hidden by a ceiling, presumably constructed in the 18th century when the north aisle was removed, but the south aisle and chancel are exposed, simple 19th century work with medieval elements, beautiful and rustic. There is no West Ruston, and the apparently redundant compass direction in the parish name is there to distinguish it from Ryston in west Norfolk - East Ruston is sometimes refered to as East Riston in old documents. The most famous son of the parish was the Classical scholar Richard Porson. His father was the parish clerk, and the education of the young Porson was taken on by the local Rector, who was impressed by his abilities. Porson went on to play a defining role in the development of philology, and his use of primary texts to prepare new translations, revolutionary in its day, has become the central basis of Classical Greek scholarship. He was one of the first scholars to apply mathematical analysis to sources. The rigour with which he approached his research and writing was learned young: it is said that, each evening, when he returned home from his lessons with the Rector, his father made him repeat them in their entirety.